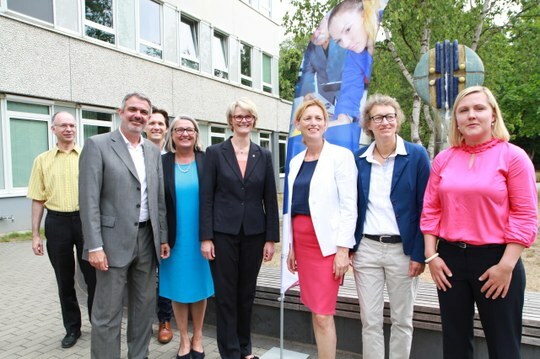 On Tuesday, July 31st, Anja Karliczek, Federal Minister of Education and Research, visited the Leibniz Institute for Science and Mathematics Education (IPN) at Kiel University. She was accompanied by her colleague from Kiel Karin Prien, Minister for Education, Science and Culture of the State of Schleswig-Holstein. The ministers emphasized the important regional and national role of the research institute. Federal Education Minister Anja Karliczek said during her visit: "We need young people who are enthusiastic about mathematics and sciences to keep up with global competition as a location for innovation. The IPN contributes significantly to strengthening STEM education in Germany. It combines scientific work with school practice - everyone involved benefits from this cooperation". Schleswig-Holstein's Minister of Education Karin Prien said that the IPN stands for outstanding educational research from Schleswig-Holstein for all of Germany and even beyond national borders. "The institute is also particularly committed to bringing young people together with scientific expertise within the framework of student research centers," said the Minister of Education. The IPN contributes to a strengthening of STEM education - both by promoting broad understanding across boards and supporting peak performers. The guests from Berlin and Kiel were welcomed by Managing Administrative Director Bent Hinrichsen and Deputy Managing Scientific Director Prof. Dr. Ilka Parchmann. Two impulse lectures, which gave exemplary insights into the research of the Leibniz Institute in Kiel followed a short introduction of the IPN. This was followed by participants exchanged thoughts and ideas. In her presentation Parchmann gave an overview of the scientific work of the research institute. "We have many STEM funding initiatives in Germany," said the Deputy Managing Scientific Director. "However, we still know too little about their lasting effects. This is where the IPN, with its various research lines, can make an important contribution to STEM education". At the same time, the Kiel Leibniz Institute's unique orientation towards pre-school and school-based learning with extra-curricular support programs and questions on the qualification of teachers, specialist staff and science communicators, is unique in Germany. Prof. Dr. Uta Klusmann, deputy director of the Department of Education at the IPN presented key findings of empirical educational research in her short lecture. "There are many different opinions about what distinguishes a good teacher," says Klusmann. Professional research focuses on two questions: How important are teachers for students' performance? And what do we know about the decisive professional and psychosocial competencies of teachers? Klusmann also addressed the associated challenges for education policy and schools. Prof. Dr. Aiso Heinze, Director of the Department of Didactics of Mathematics, discussed the influence of the choice of a mathematics textbook on the learning success of pupils. This question arises because textbooks are one of the teaching materials most commonly used by teachers to plan lessons. At the same time, schools are free to choose from various textbooks. "In a three-year longitudinal study with 93 primary school classes in mathematics, we were able to show that there are substantial differences in children's performance development depending on their textbook," said Heinze. LTR: Prof. Dr. Aiso Heinze (IPN), Bent Hinrichsen (IPN), Dr. Oliver Grundei, Dr. Dorit Stenke, Anja Karliczek (Federal Minister of Education and Research), Karin Prien (Minister for Education, Science and Culture of the State of Schleswig-Holstein), Prof. Dr. Ilka Parchmann (IPN), Prof. Dr. Uta Klusmann (IPN).